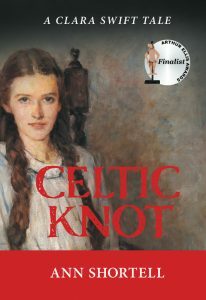 Toronto author, Ann Shortell will be in the store on Sunday, May 6 to launch her new novel, Celtic Knot. Shortlisted for a 2017 Arthur Ellis ‘Unhanged Arthur’ Award, this re-imagining of a shocking event in Canadian history is a riveting read for fans of historical fiction and mystery lovers alike. D’Arcy McGee is assassinated. As John A. Macdonald cradles his friend’s bloody head, he blames transplanted Irish terrorists: the Fenian Brotherhood. Within a day, Patrick James Whelan is arrested. After a show trial, Whelan is publicly hanged. That much is history. Did Whelan do the deed? What if Clara Swift, a mere slip of a girl, sees the trace-line of a buggy turn off Sparks Street, moments after the murder? What if housemaid Clara understands her dead mentor’s shorthand, and forges an unlikely alliance with the Prime Minister’s investigator? And ends up being trusted by the condemned man’s wife — and by Lady Agnes Macdonald . . .
It’s reimagining a crisis that tested a nation. It’s history with a mystery. It’s A Clara Swift Tale. Be sure not to miss this great event!